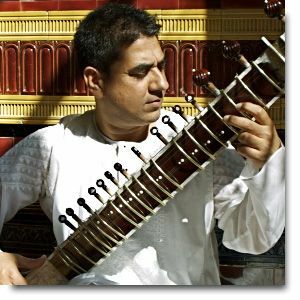 Wearing traditional Indian garb and sitting crossed-legged on a colourful rug draped over a podium, Mohamed Assani and Cassius Khan gave an absorbing and very enjoyable concert of Indian classical music, Assani playing sitar and Khan playing the tabla. They began with a piece that was based on a single prolonged major triad (seemingly provided by Assani's iPod), upon which Assani improvised a melody based on an Indian scale that sounded much like the Western Lydian scale (a major scale with a raised 4th degree). As the triadic basis never changed, the music did not have the sense of harmonic progression that most types of Western music does, but it achieved variety and form in other ways. The melodies that Assani improvised were often stepwise, with movement between pitches often achieved by a very expressive bending of the strings, rather like a blues guitarist might bend a note to change its pitch. In fact this device of bending or stretching the strings seemed integral to the style and occurred often. As for rhythm, the performers explained that the piece was based on a 16 beat cycle, though these beats went by slowly and were hard to perceive as they were buried under a wealth of rhythmic and melodic detail. The concert ended with a piece that sounded like it was based on the Phrygian scale, giving it a minor sound and contrasting with the major feel of the first piece. Both pieces gathered energy and tension as they progressed, and ended with a flourish. Assani told the audience at the end that the two of them had only rehearsed twice in the preceding months, a fact which made this refreshing and delightful concert all the more impressive. Thanks to MusicFest Vancouver for bringing the two fine artists together.